Preview Damaged #5 at Kitty's Pryde | Radical Studios, Inc.Radical Studios, Inc. 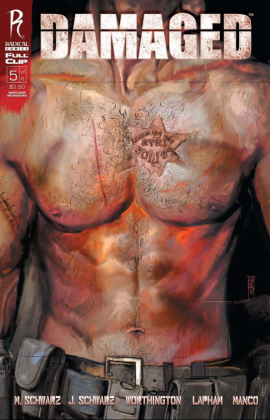 In Damaged #5, as Election Day looms, the disappearance of five corrupt police officers becomes a tipping point in San Francisco as policemen and vigilantes alike engage in their pursuit. While Lieutenant Jack Cassidy seeks these officers on the right side of the law, recently retired SFPD veteran Frank Lincoln abandons his long-held moral code in search of his brother and Isaac Lordsman, dead-set on doing whatever he has to in order to stop their destructive vigilantism. However, he may already be too late, as Henry Lincoln’s troubled protégé finally spins out of control, leaving unimaginable tragedy in his wake. Click the cover image to view a preview of Damaged #5 at KittysPryde.com or click here to learn how you can win a full set of Damaged issues #1-5!